H. Victoria Atkeson takes readers on an intimate journey to “Buttermilk Bottom,” just on the edges of Atlanta. Here one will discover a neighborhood with its own set of values, and beliefs that are born out of hate and prejudice. The neighborhood is built around crime, poverty, and dilapidated buildings. Readers will meet Crippled Jake, with a wit like you’ve never seen who is loved by all. Jake is in love with a lady that will not give him the time of day, but he continues to woo her. He becomes friends with Cameron, an ex-con who treats people with respect and fairness. Cameron is a lady’s man who enjoys their company without the commitment. 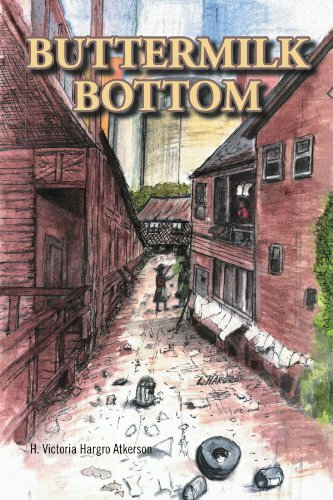 Cameron’s friend Rufus sets him up to be a numbers writer in Buttermilk Bottom where he finds the people intriguing and he loves the anonymity of living there without the “white” prying eyes. Both Jake and Cameron are captivated by Miss Queenie, owner of the local speakeasy. When Miss Queenie sets out to get a man it is no-holds-barred. She ignores Jake in a fun way, but has her mind set on getting Cameron, and finds it is harder than she thinks to get him in her bed. With Cameron’s guidance and support the men take it upon themselves to protect the others and their rights by combating the Klan. Local police will not step foot in the town due to fear of what might happen to them, and they believe these people deserve every injustice given them. Atkeson’s characters are well developed and she keeps readers feeling all emotions. The background is well researched so readers can get the full impact of what it was like to live in the south during the 50s and 60s. Her story has all the elements of a great book: love, hate, murder, mystery and mayhem. The pace is just right, characters are designed for readers to love or hate them, and all will get caught up in the relationships, challenges and insight into a town within a town. I recommend “Buttermilk Bottom” by H. Victoria Atkeson for an insightful, entertaining story.